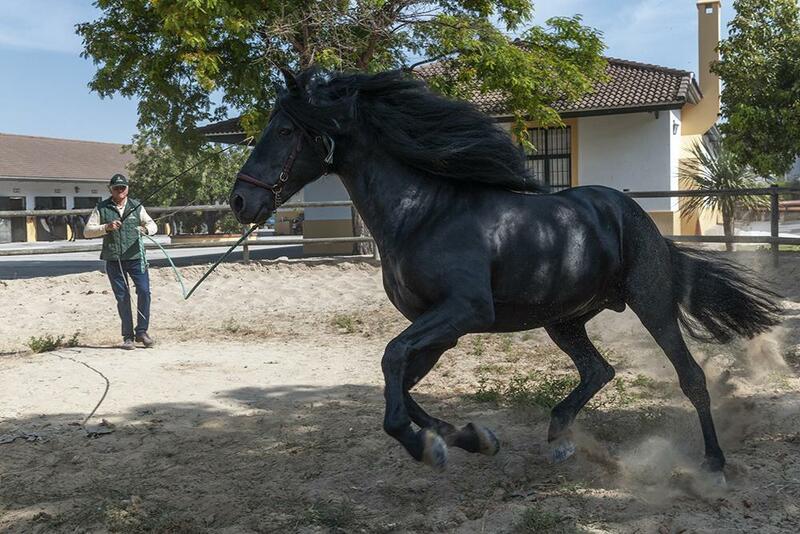 This P.R.E. 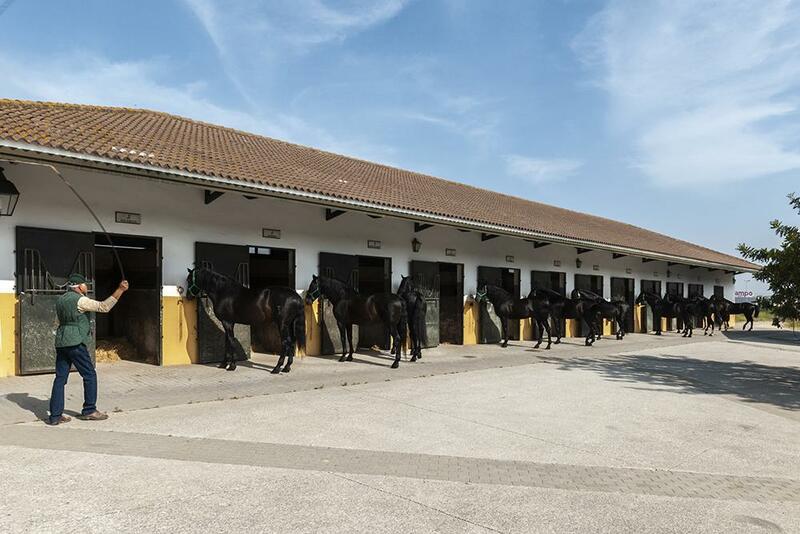 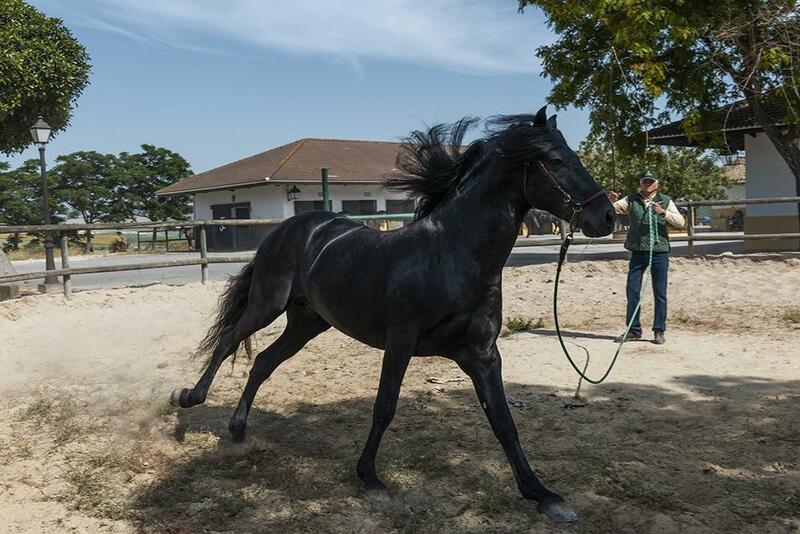 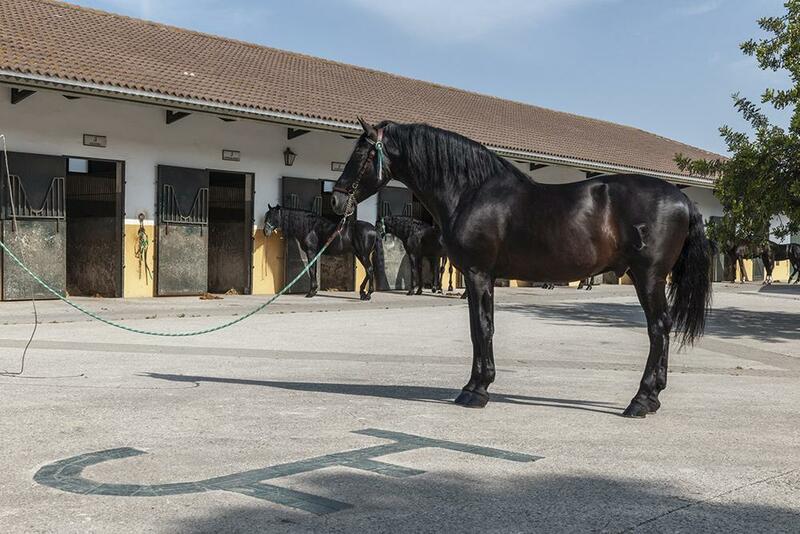 breeding farm was born about 25 years ago from the great passion for horses of José Estévez de los Reyes, father of one of the current owners Juan Carlos Estévez Puerto. 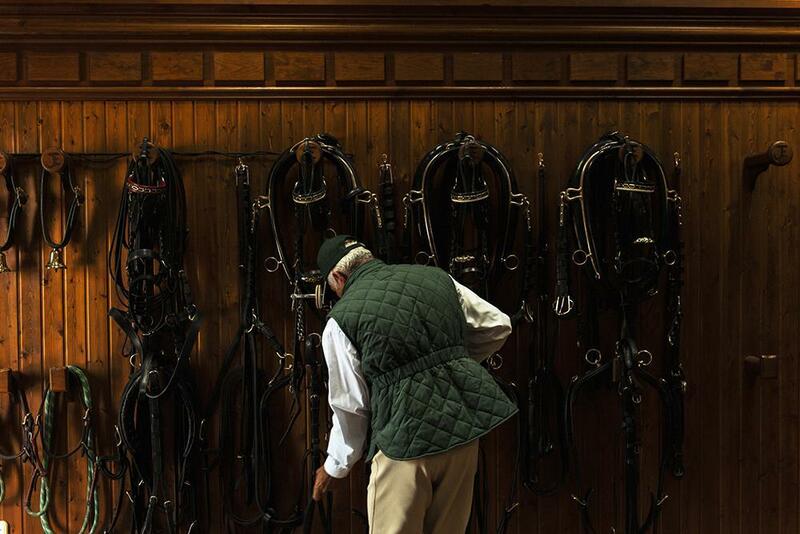 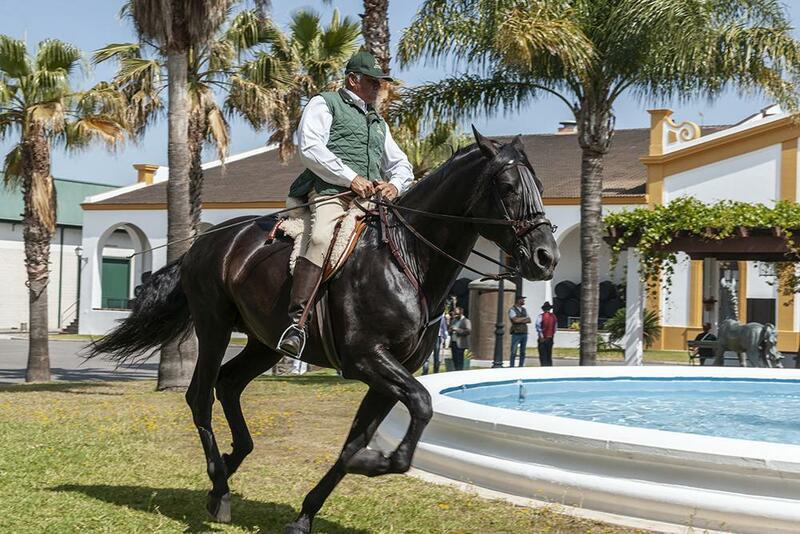 “Horses were the only sporting activity that interested my father,” explains Juan Carlos, “he liked hitching, so 25 years ago he decided to buy some mares, fillies and a stallion to start breeding PREs”. 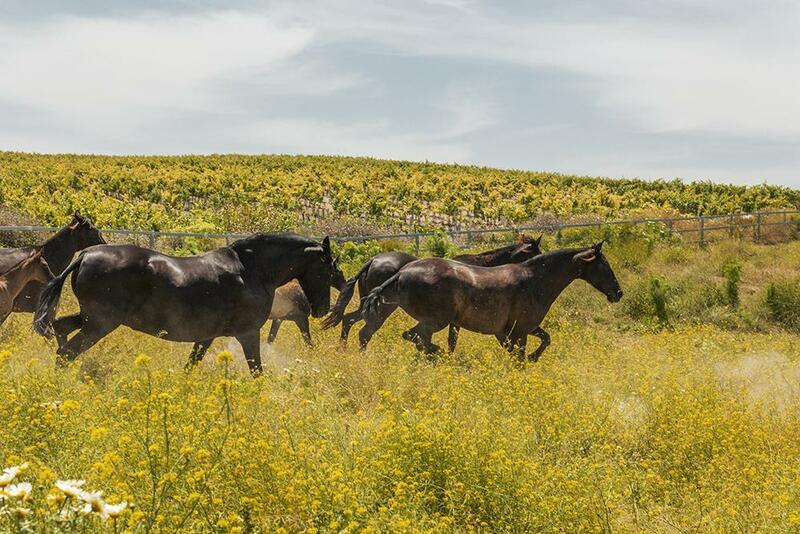 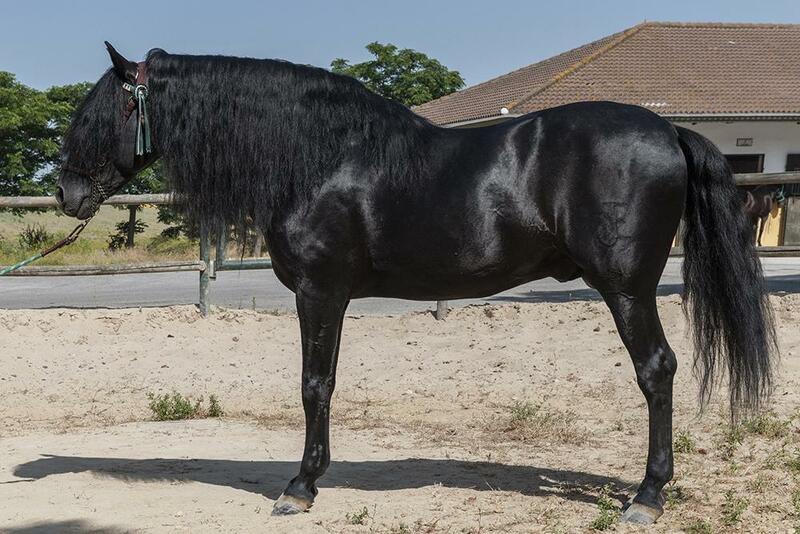 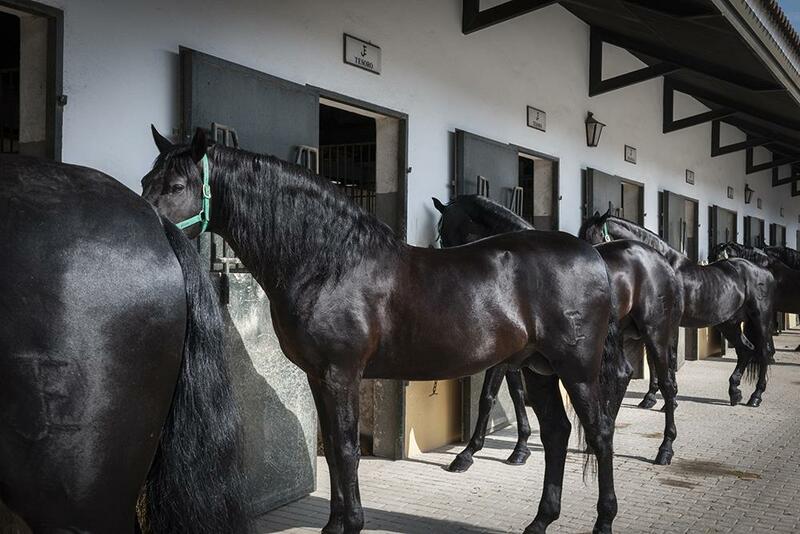 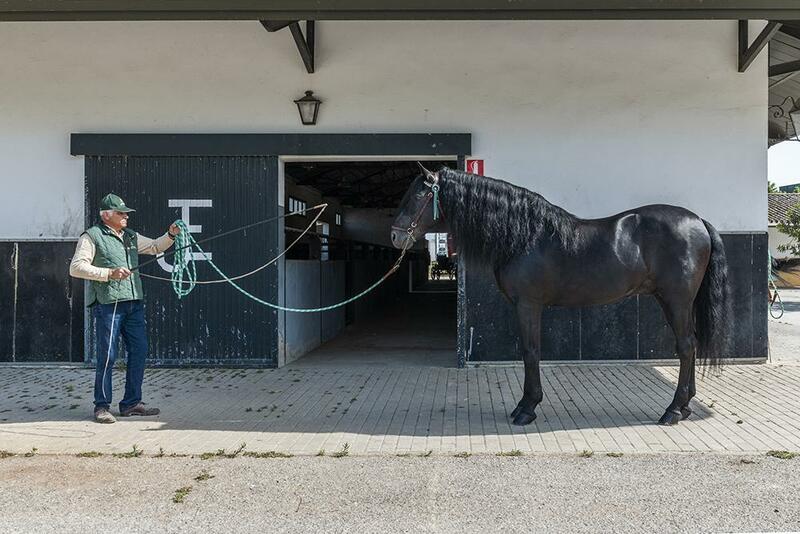 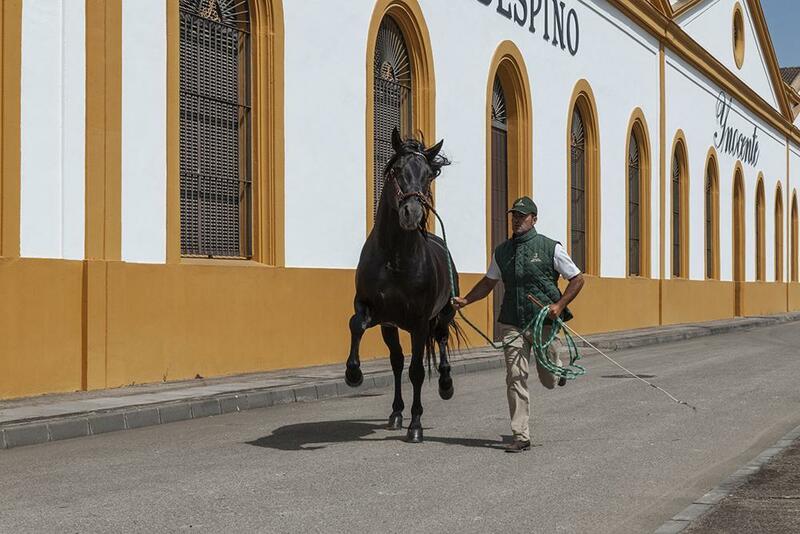 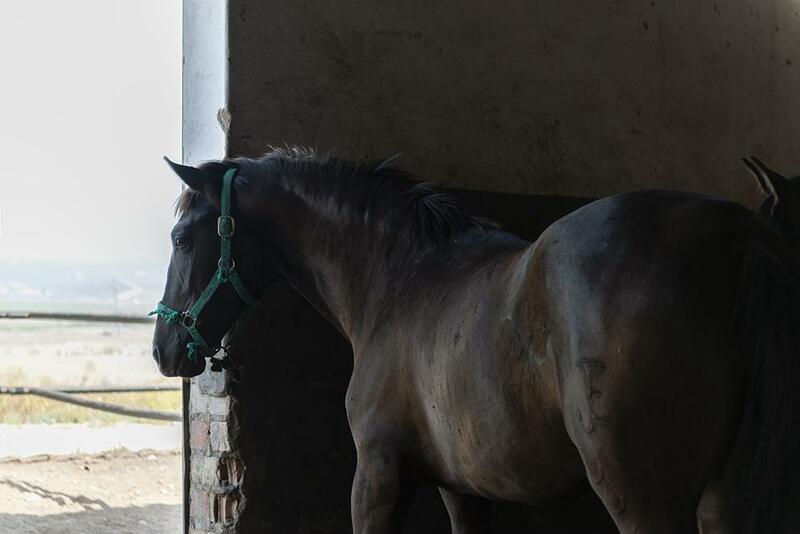 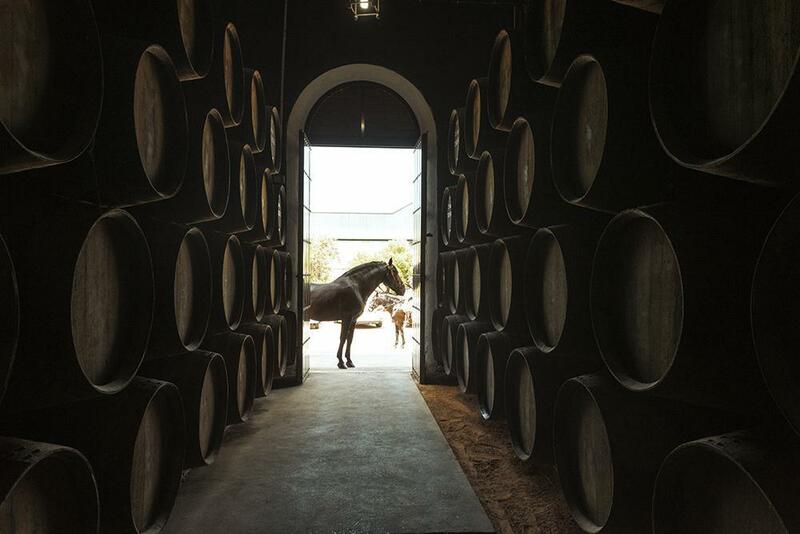 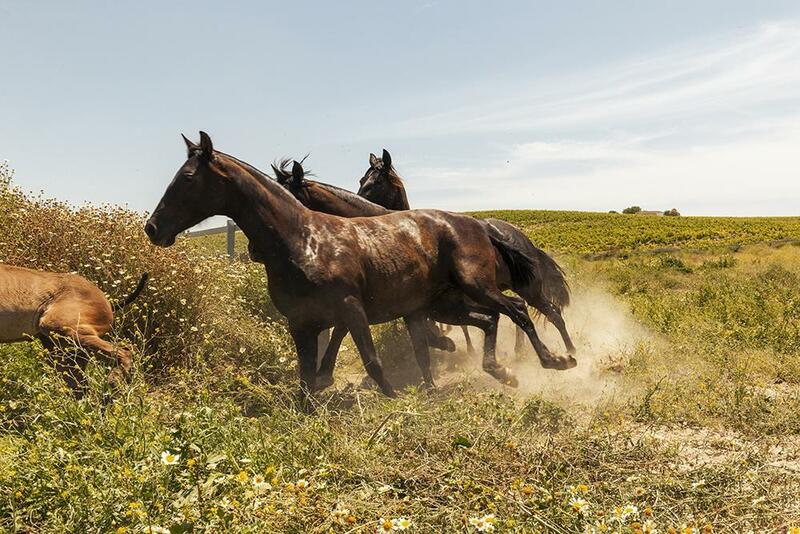 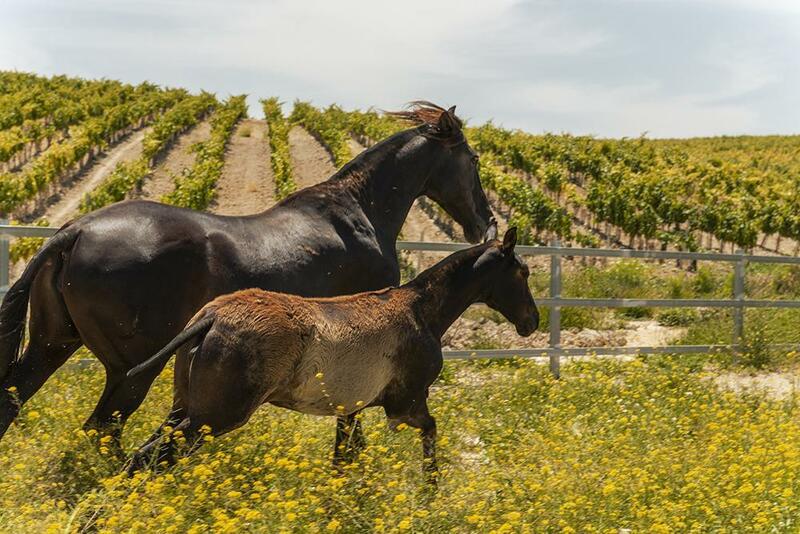 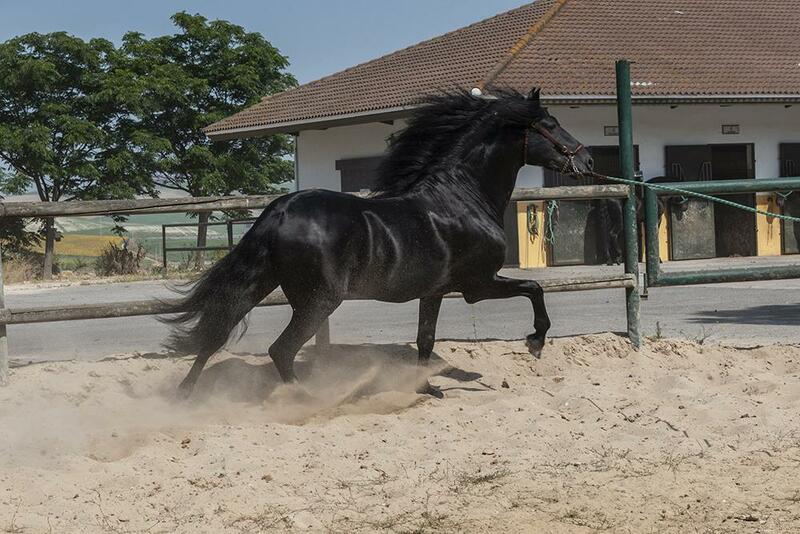 The farm was started with horses from the Martínez Boloix and the Hierro del Bocado bloodline, but today, after 25 years, the Yeguada Real Tesoro has its own genealogy: beautiful horses, with a very distinctive nose line and above all, all with a black coat. 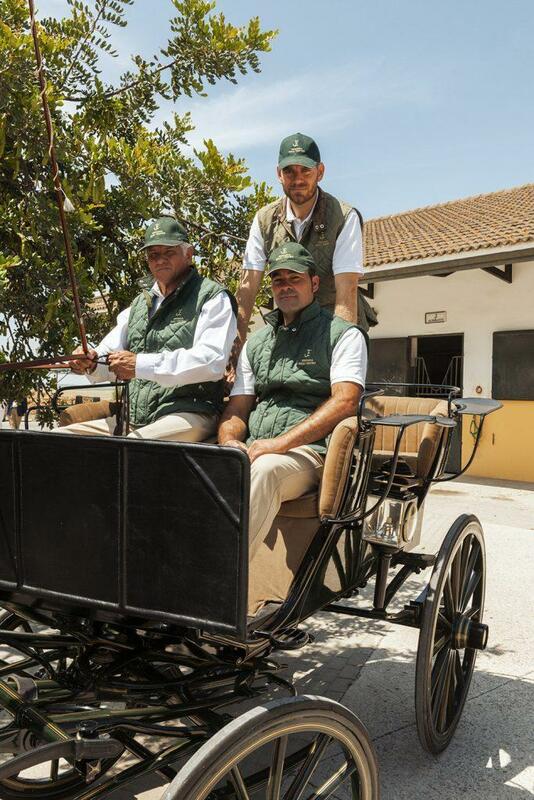 The Yeguada Real Tesoro there empoys 3 people, the mayoral Luís Chacón Sevillano with two stable boys Javier y José Luís; they are also helped by Antonio who takes care of the mares in the pastures around the vineyards owned by Grupo Bodeguero José Estévez, SA, located 15 minutes away from Jerez de la Frontera. 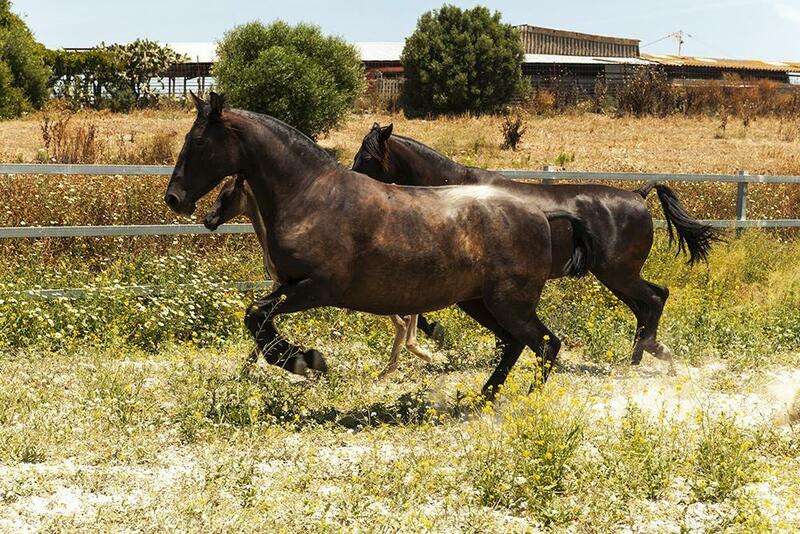 Antonio takes care of them as if they were his children, knowing every animal to perfection. 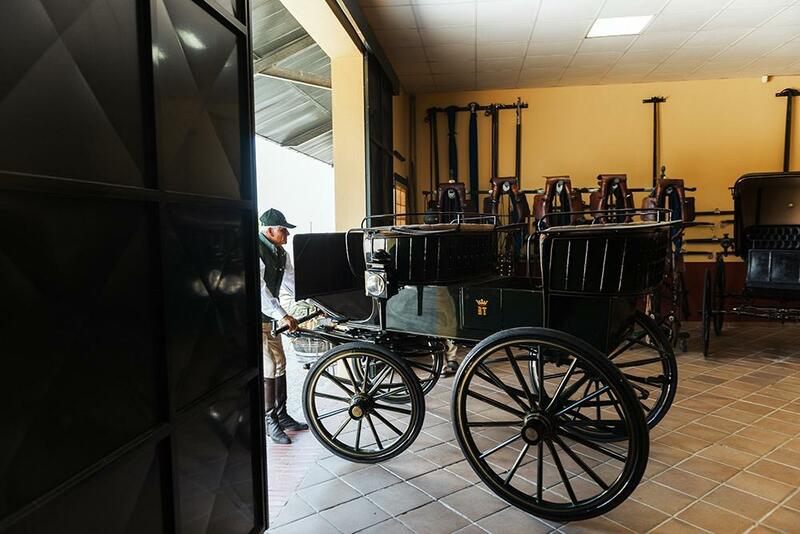 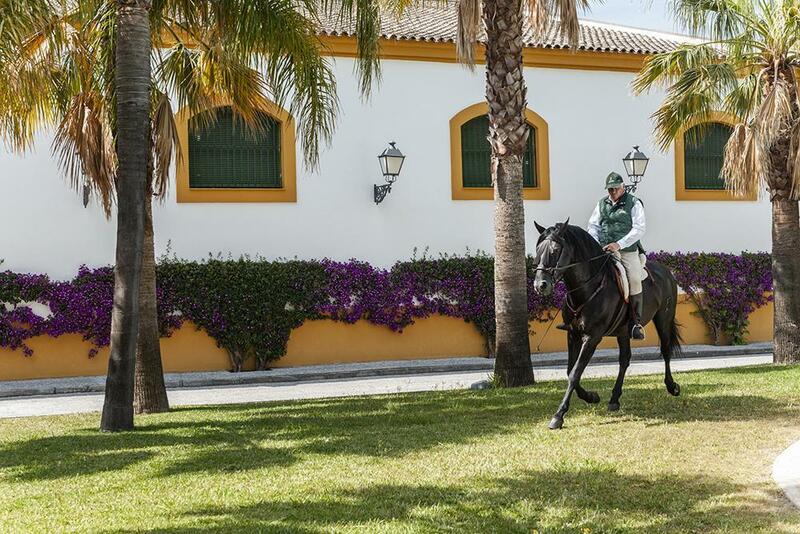 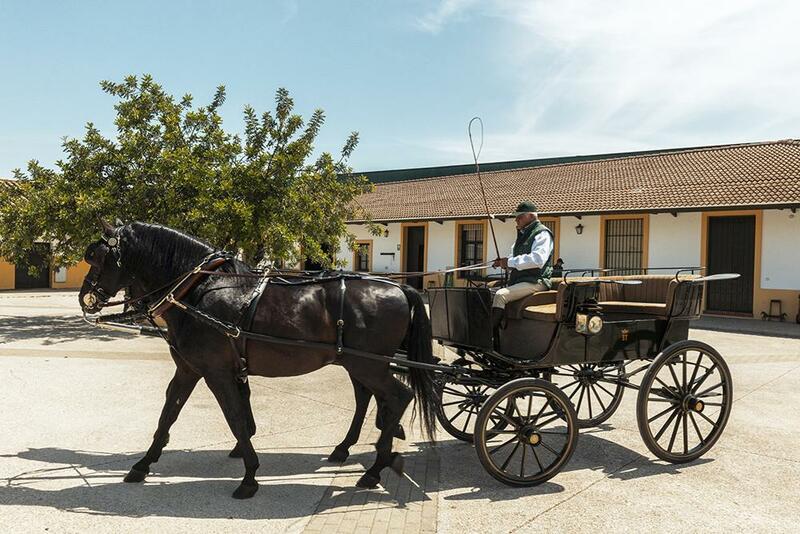 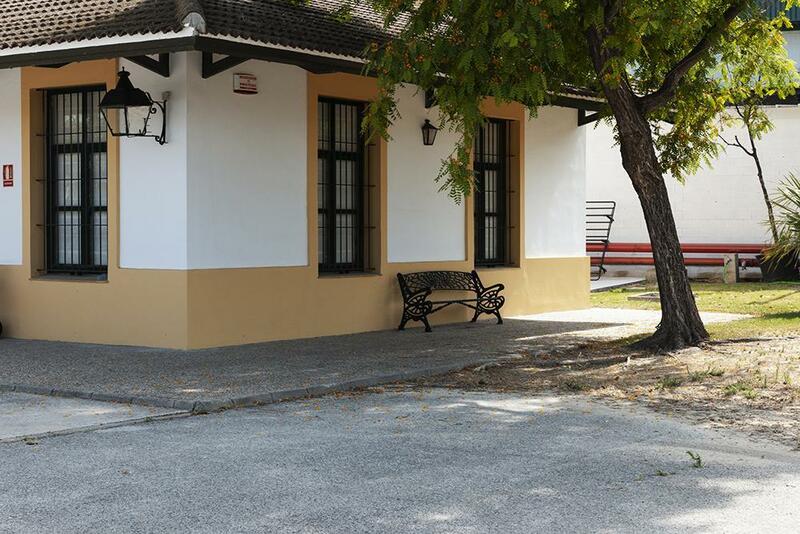 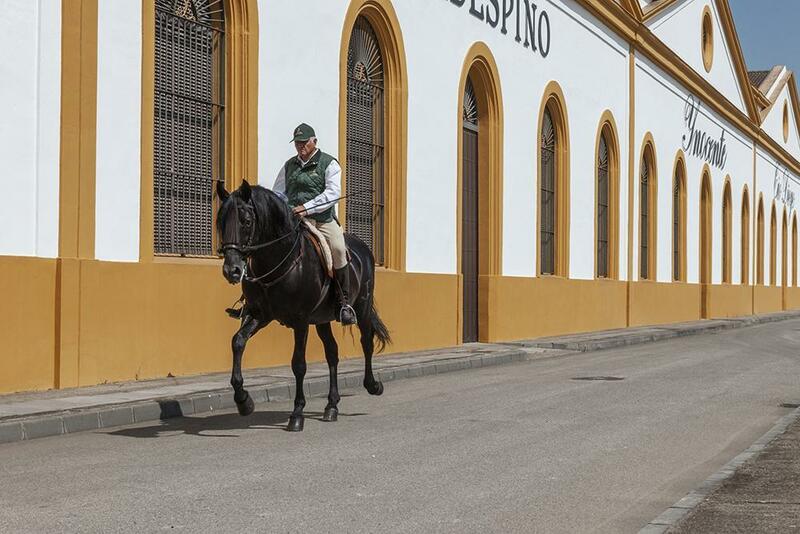 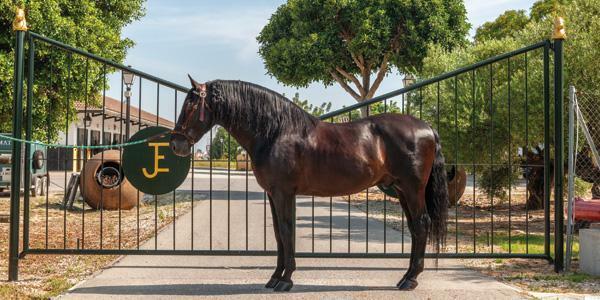 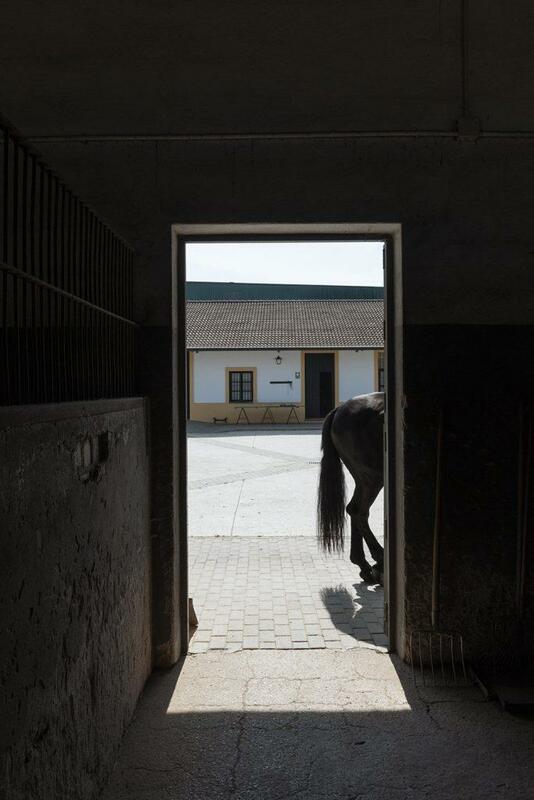 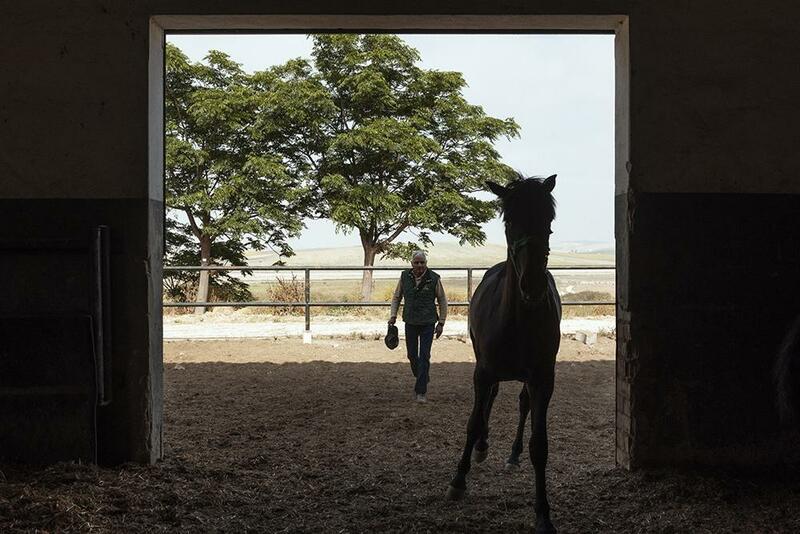 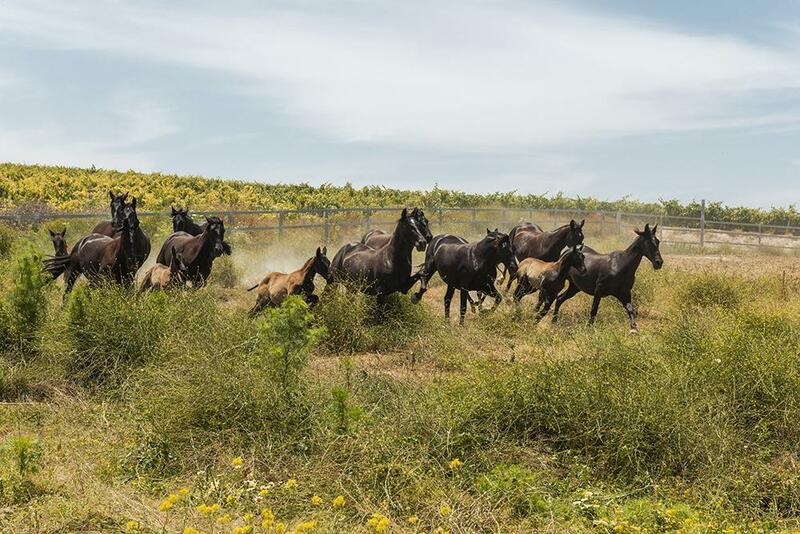 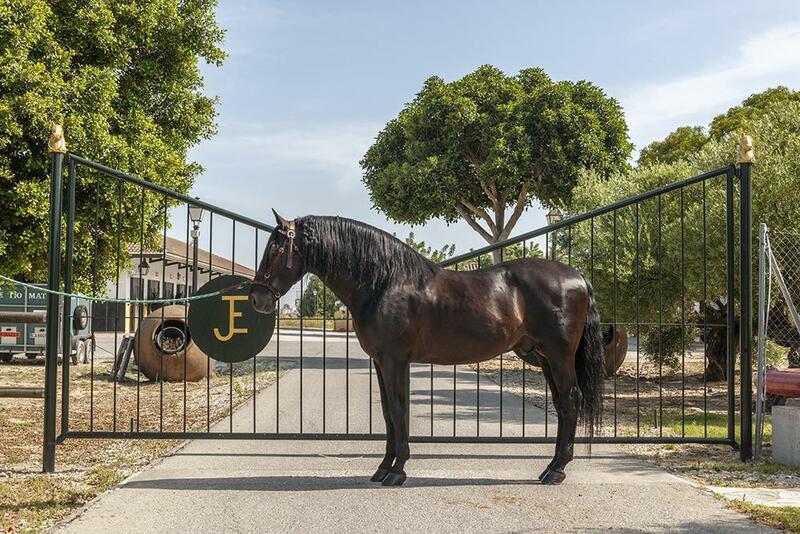 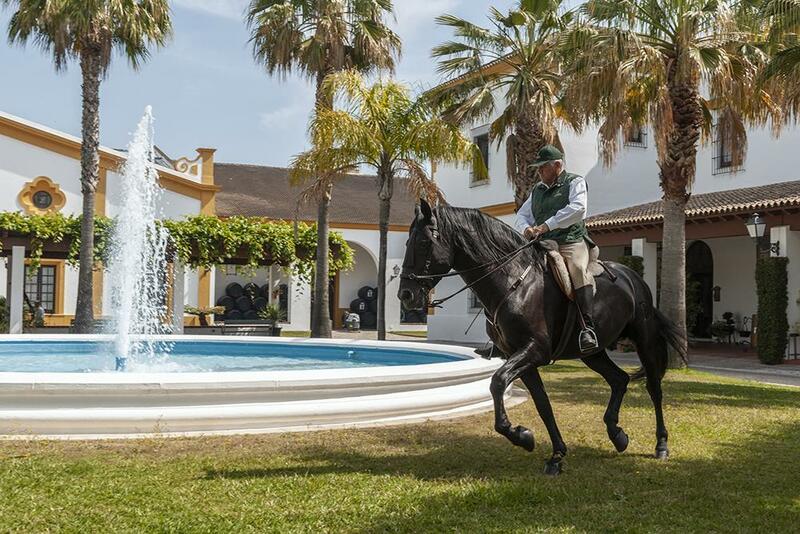 This stud farm is part of the Grupo Estévez SA, famous for its Jerez wines, for this reason each horse is named after one of the company’s legendary products, the most famous is Tío Diego, the main stallion of the house, a beautiful 14 years old P.R.E. 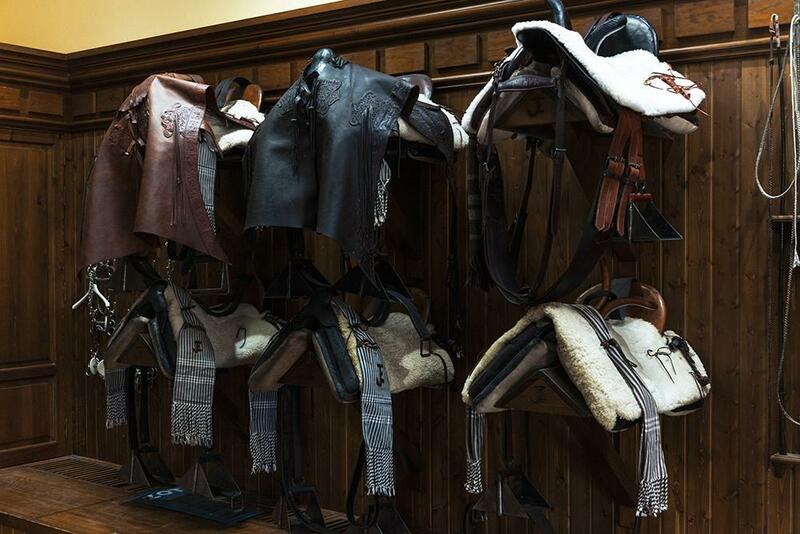 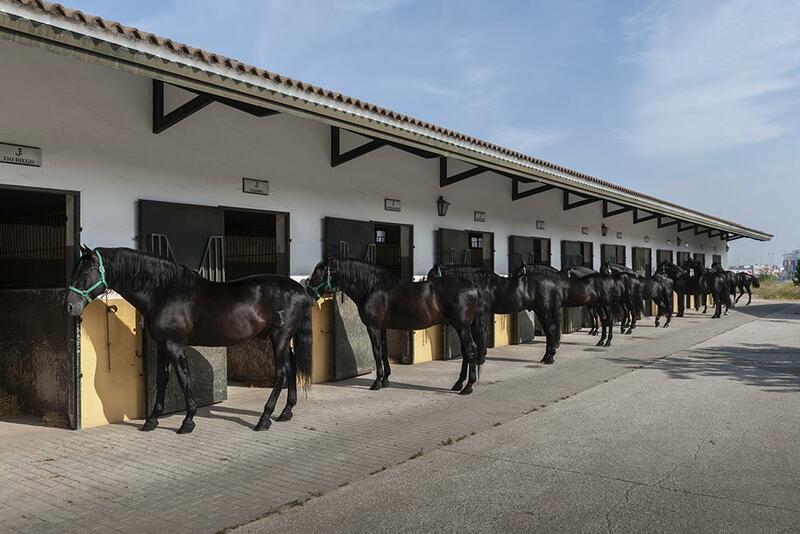 At the moment the Yeguada Real Tesoro has about 42 horses, between mares, stallions, foals and fillies. 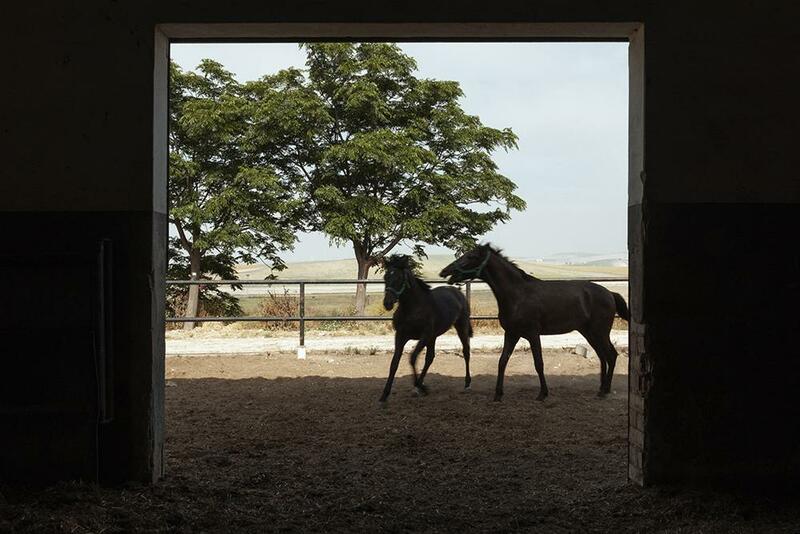 At the farm they try to create between 5 and 8 horses a year. 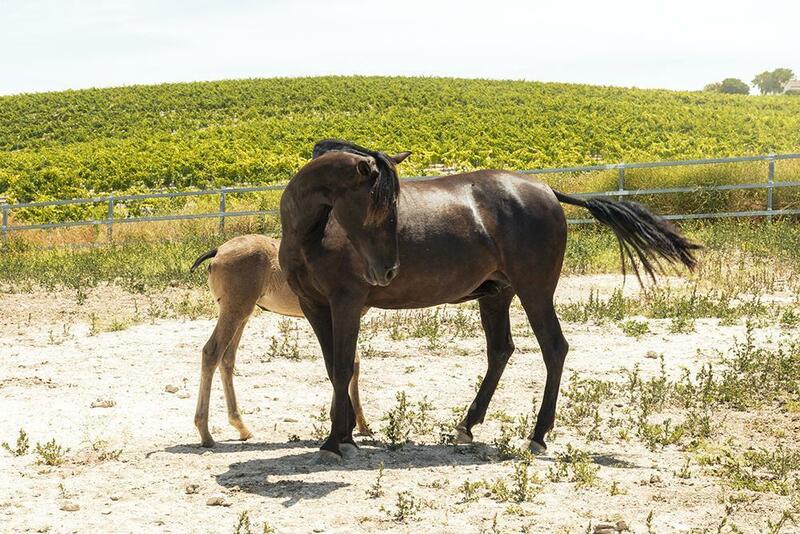 In the 90% of cases reproduction takes place with natural mating, the remaining 10% with artificial insemination. 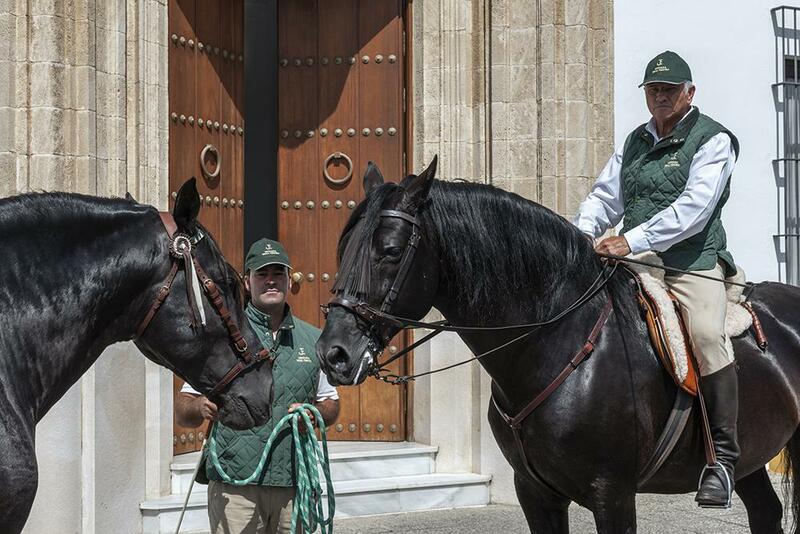 Juan Carlos explains “we inseminate our mares with our stallions, then if I find a horse that I like very much, I have no problem using him, but I must like him a lot!” The market is still in a difficult situation, for this reason the stud farm Real Tesoro in recent years has limited the number of horses produced, focusing extensively on the specimen quality, putting in place a very careful selection that after 25 years has brought great results, Juan Carlos states “we are satisfied with our horses, we have made a good selection in these past 25 years”, he continues, “unfortunately the market is still very much in crisis, and people want to buy horses for ridiculous prices, almost as gifts, if we have to sell them, maybe to those who do not even really care about them properly, we’d rather not sell and keep them, it’s also a matter of maintaining the prestige of this breed and of our company”.